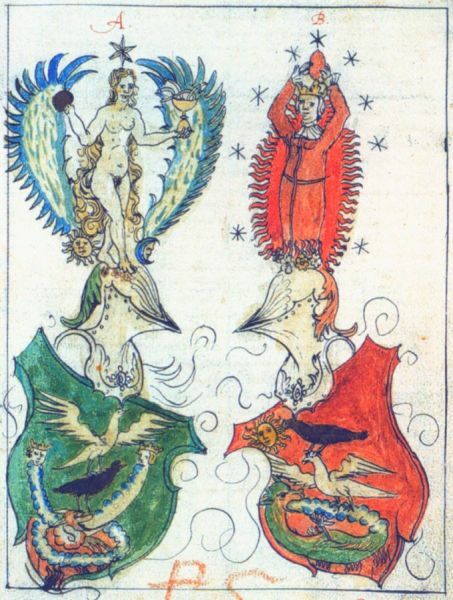 Das Buch der heiligen Dreifaltigkeit (Book of the Holy Trinity) is among the first alchemical manuscripts to incorporate emblematic imagery. It dates to the early decades of the 15th century, around 1420. 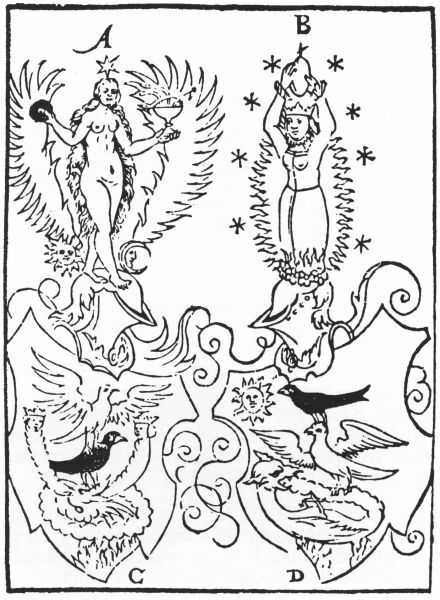 It has a series of alchemical figures among which two have some connection to heraldry. I show here one of the figures from a later version in a 1550 manuscript in Basel. In 1582 Hieronymus Reusner issued his influential book Pandora, printed in Basel. This was illustrated with a series of woodcuts and it seems obvious that these were taken from the imagery in this Basel manuscript. It shows in parallel two symbolic coats of arms labelled A and B. Reusner's text commenting on these at this point is instructive. Of the figure on the left he says "Here the fixed has been made volatile, the water that remains is the mother of a stone". Of the rightmost one "Here the volatile has been made fixed, the medium of the philosophers is the father of a stone". Each of these presents a conventional heraldic device such as were used in 15th century German heraldry, with a shield, a helmet and the crest (the image that stands above the helmet). Firstly, let us look at the crests. That on the left shows a female figure standing within a pair of wings. At her feet are the Sun and Moon and she holds in her hand a chalice with three serpents and a round globe in the other. Above her head shines a white star. On the right we have a red king standing in a nimbus of flames and holding above his head a red egg like form. Around him are set nine stars. The helmets are conventional, that on the left having a crest of green fronds, while the rightmost has a red crest. The original art of the men of philosophy. The Raven which flies by night. Hermes' bird, which I am declaring to you. Well known to many philosophers. This emblem demonstrates a point I have been trying to make for some decades, that one should never rush to interpreting an alchemical emblem. These rarely stand alone, but are part of a long tradition of alchemical imagery. The context for many such emblems goes back hundreds of years. Thus our German almanac image must be seen as emanating from the earliest phase of alchemical imagery. Most modern commentators on alchemical imagery have no idea about this, but merely project their own preconceptions into their 'interpretation'. Sadly, Das Buch der heiligen Dreifaltigkeit, remains untranslated and can only be read by those familiar with early 15th century German. Its text would be very instructive. Here is the corresponding woodcut from Reusner's Pandora, 1582.